The Artists Cooperative Gallery’s mission of supporting regional artists and connecting their community took a global approach this year with an artistic and cultural exchange program developed with Costa Rica. A desire to introduce the artist coop model to Costa Ricans led to a partnership with the Cultural Exchange Department in San Jose. Five Omaha Coop artist-members-Judith Anthony Johnston, Katrina Methot-Swanson, Lori Elliott-Bartle, Cheri Ginsberg and Linda Hatfield-exhibited work and helped create a similar cooperative approach with artists and community builders in the region. The complement to the exchange begins in June, when five Costa Rican artists exhibit their work in Life in Color in Omaha at the Artists Cooperative Gallery. The exhibiting artists include Isidro Con Wong, who infuses elements of his Chinese ancestry with the inspiration he takes from the family farm he grew up on in Costa Rica. Elisa Morera’s work reflects a variety of styles. While focusing on items in realism like flowers and portraits, her work can take on impressionist or even surrealistic tones to evoke emotion and inward reflection. Martha Espinoza taught herself by studying the great masters but became drawn toward abstraction and symbolism following her husband’s death in 2011. The connection of the figures in her work may be puzzling at times but ultimately reflect a harmonious world. Born in Costa Rica, Beatriz Bearden came to the United States as a young girl. The journey she made as a child and subsequent travel has inspired work that reflects the diversity humanity and captures moments that reflect her subjects’ lives. Monica Lizano tells stories through her work using vibrant color and symbolism. 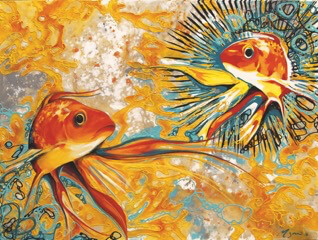 Fish appear often in her work, conveying the energy and emotional process we take I our lives. The artists will also be conducting an all-ages printmaking workshop on Saturday, June 4 from 1-3pm. The Cultural Exchange Program’s coordinator, Judith Anthony Johnston, hopes to keep this relationship growing. She says there is a plan to create sister cities between Omaha and Alajuela, Costa Rica and continue creating gallery exchanges. Longer term goals will hopefully include new countries to partner with. Life in Color has an opening reception, Friday, June 3, 6-9pm at the Artist Co-op, 405 S. 11th St. in the Old Market. The exhibit continues until June 26 with a printmaking workshop, Saturday, June 4, 1-4pm.